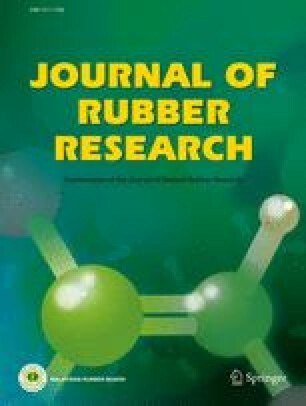 The synthesis of polyisoprene (isoprene rubber) in latex form was carried out by conventional emulsion polymerisation and by miniemulsion polymerisation using hexadecanol as a hydrophobe and the two methods compared. The influence of an emulsion system, monomer and surfactant concentration on conversion, particle size, gel content and coagulation were investigated. Molecular characteristics, thermal behaviour and stereochemistry were investigated by GPC, DSC, TGA and 1H-NMR. With decreasing monomer concentration and increasing surfactant concentration, the number of stabilised droplets in the miniemulsion was found to increase. The greater number of loci for the polymerisation reaction thus obtained a lead to an increased conversion as well as a reduced gel content.